Amsterdam Quarterly (AQ) will hold its sixth annual Yearbook launch, party, and reading on Friday, 20 January 2017 from 6 to 7.45 PM at the American Book Center, Spui 12, second floor, in Amsterdam. The AQ 2016 Yearbook includes an interview in Dutch with photographer Carel van Hees about his Rijksmuseum Document Nederland exhibition (translated into English by AQ editor Bryan R. Monte and Amsterdam novelist Philibert Schogt). The AQ 2016 Yearbook also includes poetry by T. S. Eliot Poetry Prize winner, Philip Gross, poetry and fiction by Dorothy Sargent Rosenberg prize winner, Srinjay Chakravarti, digital images by Yolanda V. Fundora (including the yearbook’s cover image below) and photography by Rink Foto. Readers at the event will include Arthur Allen, Simon Brod, Kate Foley, Amina Imzine, Sarah Kinebanian, Bryan R. Monte, Philibert Schogt and Patricia Seman. They will read poetry, fiction and memoirs in English with some Dutch translations about AQ’s three 2016 themes: War & Peace, (AQ15), Interiors, Gardens, Landscapes and Music (AQ16), and Climate Change (AQ17). Themes for 2017 are Medicine (AQ18), Animals (AQ19) and Education (AQ20) with reading periods in January, April and July 2017 respectively. 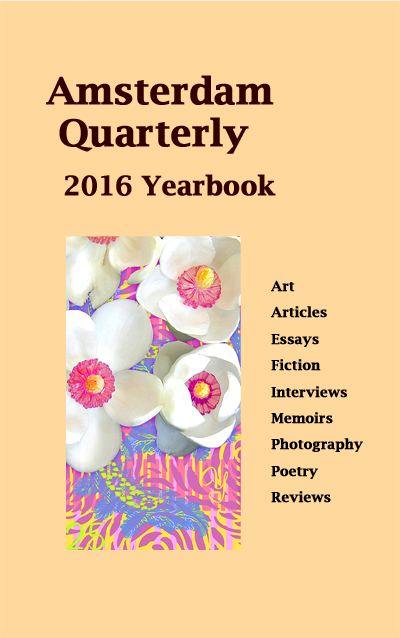 Amsterdam Quarterly was founded in 2011. Its mission is to publish, promote and comment on art and writing in Amsterdam, the Netherlands and the world. AQ publishes art, articles, drama, essays, fiction, interviews, memoirs, photography, poetry and reviews of local and international writers. AQ is published online in the spring, summer and autumn at www.amsterdamquarterly.org and at amsterdamquarterly.nl and as a print-on-demand yearbook compilation in the winter. In addition, AQ has a writers’ group which meets in Amsterdam on the third Sunday of the month from September to June. Entrée to the AQ 2016 Yearbook launch/party/reading is free.